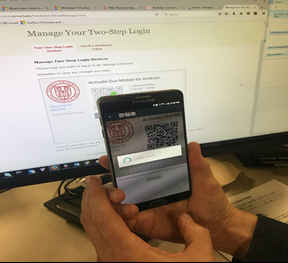 The Duo Mobile app has streamlined the Two-Step process by integrating Smartphones for identity verification. 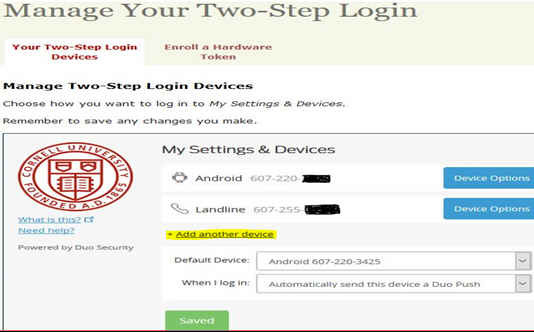 You can leverage your Smartphone to obtain access to Cornell resources by utilizing the Duo Mobile app. 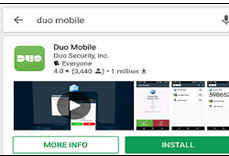 Below are instructions on how to setup, install and use Duo Mobile. By default, the Goggle Play Store is installed on your Android device and can be used to locate and install the Duo Mobile app. Find the Play Store icon on your Android device and touch the icon to open the play store. By default, the Apple App Store is installed on your Apple device and can be used to locate and install the Duo Mobile app. Find the App Store icon on your Apple device and touch the icon to open the App store. Within the Play Store, type Duo Mobile in the search field at the top of the screen (touch where it says Google Play). 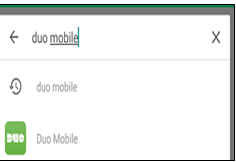 When you have located Duo Mobile from the search, select the app and touch Install. Within the App Store, type Duo Mobile in the search field at the top of the screen. 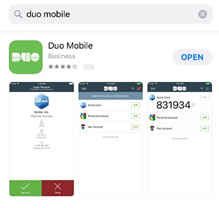 When you have located Duo Mobile from the search, hit OPEN and install the app. 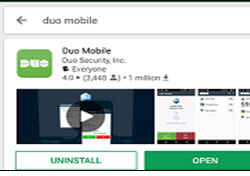 After Duo Mobile’s installed, open the app on your device. It will prompt you to allow notifications. Select Allow. A welcome to Duo Mobile screen will appear. Select Get Started. 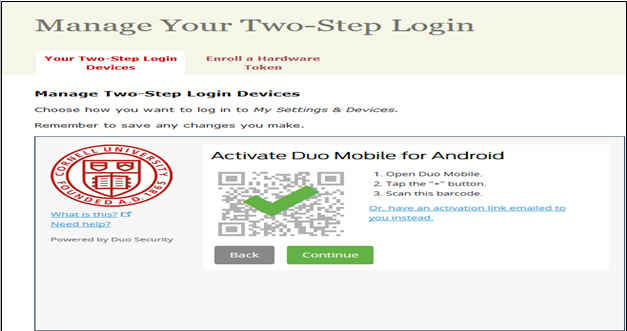 To setup Duo Mobile on your Smartphone, on a computer, go to Cornell’s Manage Your Two-Step Login webpage. 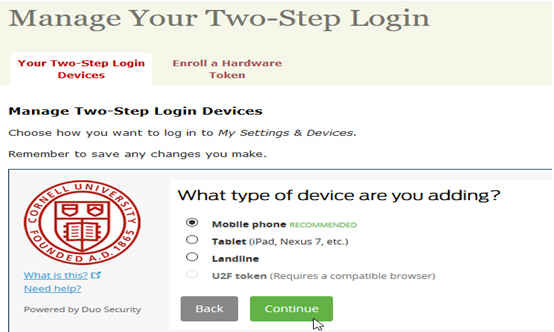 Click on Manage Your Two-Step Login and enter your netid and netid password (scroll down until you see Manage Your Two-Step Login on the right hand side of the webpage). 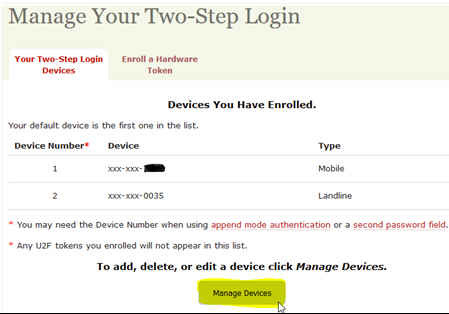 Select Manage Devices to add your Smartphone to the list of Two-Step verification options. Please note, you’ll need to verify your identity through the Two-Step process before you’ll be able to enter Managed Devices and add your Smartphone by having Two-Step call your office phone, another landline, or another cell phone to verify your identity. Select Add another device in My Settings & Devices. Add your phone number (You don’t need to enter dashes) -> choose the check box to verify you typed the number correctly -> select Continue. Click the check box to verify the type of Smartphone you have -> Continue. 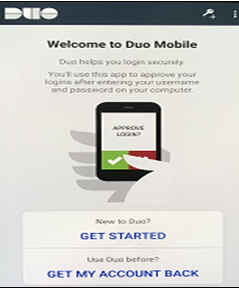 Verify you have installed the Duo Mobile app on your Smartphone by clicking on I have Duo Mobile installed. 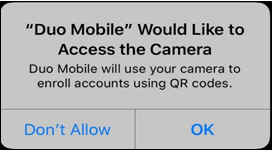 A green check mark will appear over the barcode indicating that your phone has been added to your Two-Step devices and Duo Mobile is linked from Two-Step to your phone. You will be returned to the My Settings and Devices screen. Verify the Smartphone you added has been included in your list of available devices for Two-Step.